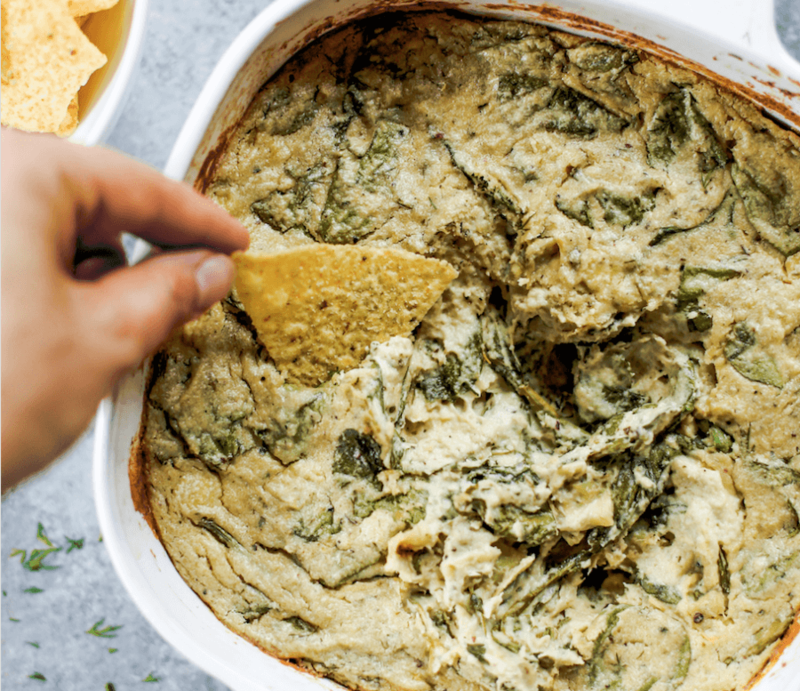 Creamy vegan artichoke dip made with cashews instead of dairy. A healthy snack and dip for veggie sticks, crackers, or bread. 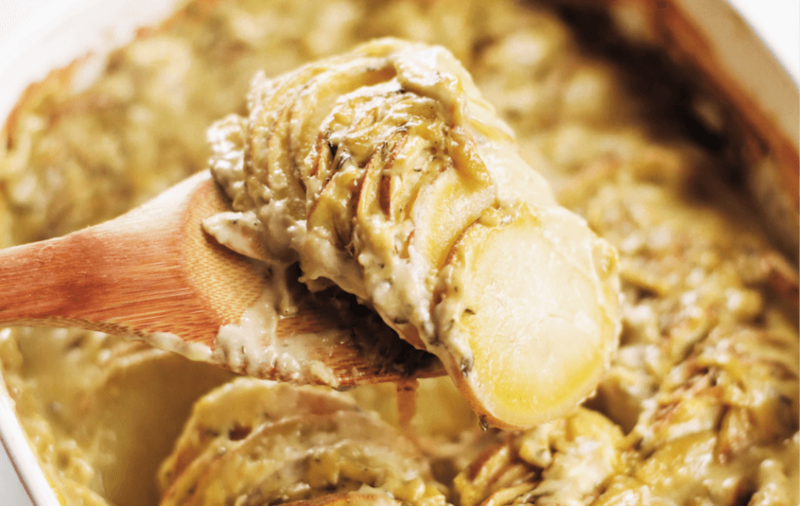 This paleo artichoke dip recipe is so easy to make and will keep you full and satisfied. Soak raw cashews (in a glass jar) in hot water for about 15 minutes or until soft, then drain and add to a food processor. Combine with lemon juice and almond milk until cashews are blended into a smooth and creamy consistency. Add rest of ingredients (except spinach and 1 cup diced artichoke hearts) and blend until combined. Transfer dip into a bowl and stir in spinach and chopped artichoke hearts. Transfer dip to a 8" by 8" baking dish. Bake on 350F for about 45 minutes until golden on top, then serve with chips or veggie sticks. Store in fridge or freezer. Nutrition Facts Vegan Artichoke Dip Amount Per Serving Calories 122 Calories from Fat 81 % Daily Value* Total Fat 9g 14% Saturated Fat NaNg 0% Trans Fat NaNg Polyunsaturated Fat 2g Monounsaturated Fat 3g Cholesterol NaNmg 0% Sodium 177mg 7% Potassium 68mg 2% Total Carbohydrates 7g 2% Dietary Fiber 2g 8% Sugars NaNg Protein 4g 8% Vitamin A 16% Vitamin C NaN% Calcium 4% Iron 10% * Percent Daily Values are based on a 2000 calorie diet. Homemade dinner rolls made with almond flour. These healthier paleo bread rolls are so easy to make and have no yeast! It’s an easy gluten free bread recipe that the whole family will love. Perfect for serving with soup for dinner or with eggs for breakfast. Preheat oven to 375F. Grease a 8" pie pan with coconut oil. In a bowl combine all ingredients for dinner rolls until the dough is smooth. 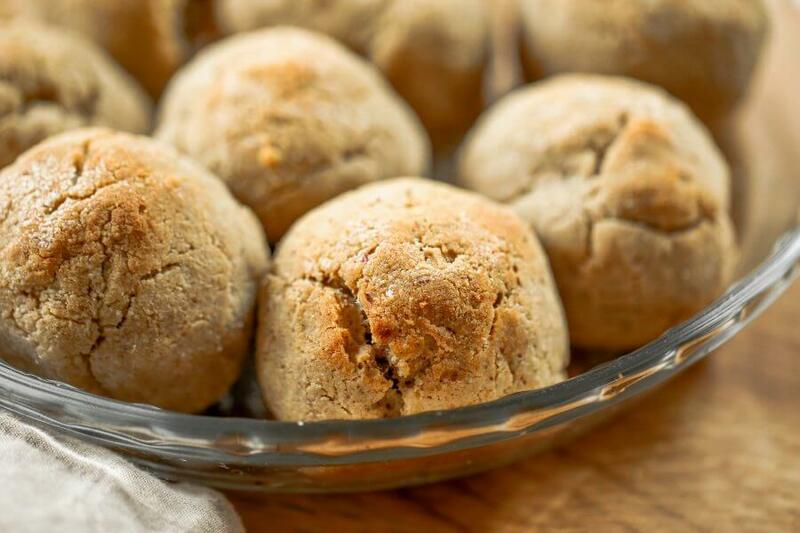 Separate dough into 10 equal balls, then shape into dinner rolls in the palms of your hands. Set in baking dish and brush with butter or egg wash. Bake on 375F for 25 minutes until golden on top. Nutrition Facts Paleo Dinner Rolls Amount Per Serving Calories 286 Calories from Fat 198 % Daily Value* Total Fat 22g 34% Saturated Fat 7g 35% Polyunsaturated Fat 0.2g Monounsaturated Fat 1g Cholesterol 74mg 25% Sodium 599mg 25% Potassium 24mg 1% Total Carbohydrates 18g 6% Dietary Fiber 12g 48% Sugars 2g Protein 8g 16% Vitamin A 2% Calcium 20% Iron 8% * Percent Daily Values are based on a 2000 calorie diet. Cheese-free vegan scalloped potato recipe. Easy paleo and whole30 sweet potato casserole for breakfast, lunch, or dinner. A healthy sweet potato side dish for anytime of year! In a saucepan whisk all ingredients together (except potatoes). Heat the sauce over medium heat and whisk continually for about 2-4 minutes until it simmers, thickens, and reaches a thick gravy-like consistency. Layer the 1/4" thick sliced sweet potatoes into an 8" casserole dish. Pour sauce over potatoes and bake on 350F for about 80 minutes until bubbly and golden on the top. Nutrition Facts Scalloped Sweet Potatoes Amount Per Serving Calories 321 Calories from Fat 171 % Daily Value* Total Fat 19g 29% Saturated Fat 15g 75% Polyunsaturated Fat 0.03g Monounsaturated Fat 0.01g Sodium 620mg 26% Potassium 242mg 7% Total Carbohydrates 30g 10% Dietary Fiber 5g 20% Sugars 6g Protein 9g 18% Vitamin A 189% Vitamin C 12% Calcium 3% Iron 20% * Percent Daily Values are based on a 2000 calorie diet. Avocado lime dip ready in two minutes! Vegan avocado guacamole dip, perfect dip for veggie sticks, crackers, and chips. Easy paleo and whole30 side dish. 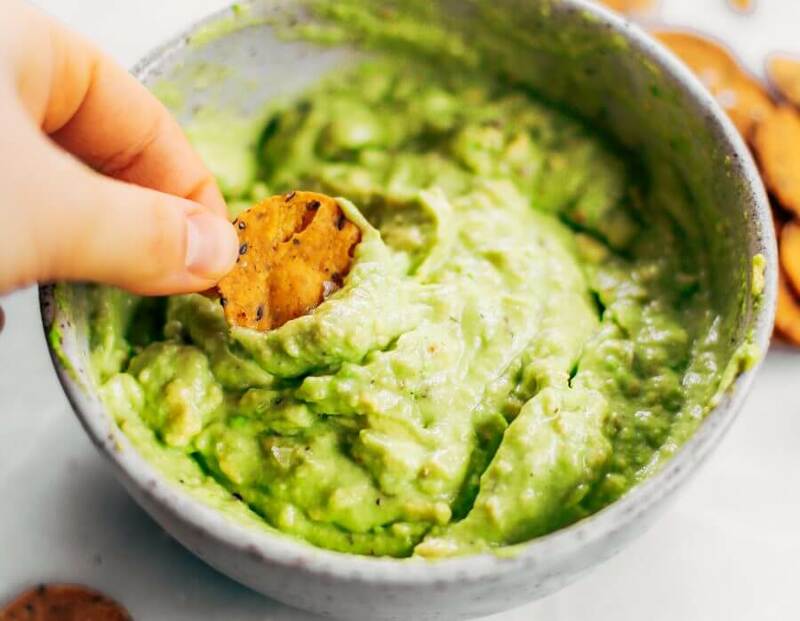 This fresh and tasty avocado dip is a life-changing easy meal prep hack- add it to any dish to upgrade your meal. In a bowl mash all ingredients together with a fork and serve. Nutrition Facts Avocado Lime Dip Amount Per Serving Calories 89 Calories from Fat 72 % Daily Value* Total Fat 8g 12% Saturated Fat 3g 15% Polyunsaturated Fat 1g Monounsaturated Fat 4g Sodium 123mg 5% Potassium 188mg 5% Total Carbohydrates 4g 1% Dietary Fiber 3g 12% Sugars 0.2g Protein 0.2g 0% Vitamin C 5% Calcium 0.01% Iron 3% * Percent Daily Values are based on a 2000 calorie diet. How to make crispy sweet potato fries in 30 minutes! 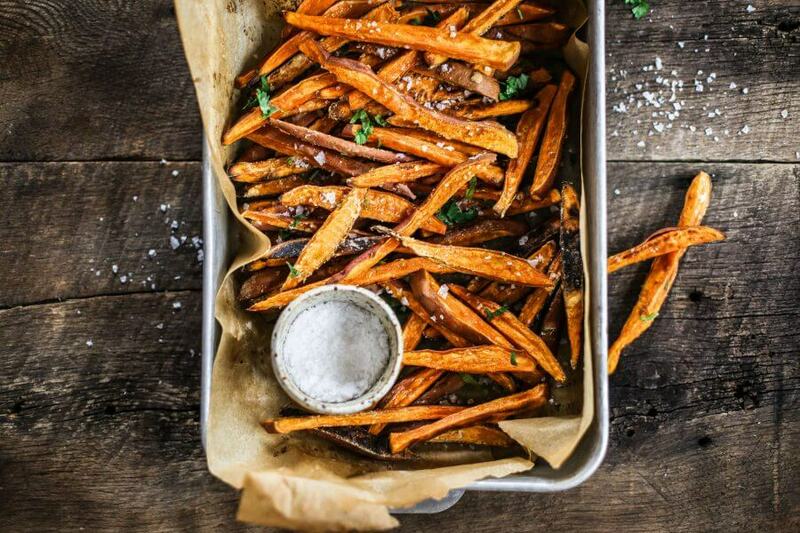 Paleo and whole30 sweet potato fries are a healthy side dish or snack. Make these easy sweet potato fries to serve along a salad or soup. Delicious! Crispy! Easy! Preheat oven to 425F. Line two baking trays with parchment paper. Slice sweet potatoes into 1/4" thick strips lengthwise and divide between the two baking trays. Drizzle 1 tablespoon olive oil over each set of sweet potatoes and toss until evenly coated. Toss 1 tablespoon tapioca flour with each set of sweet potatoes until evenly coated, then bake on 425F for about 25 minutes until golden, then turn them and cook for another 5-10 minutes or until crispy on the edges. Sprinkle with sea salt- to taste. Nutrition Facts Sweet Potato Fries Amount Per Serving Calories 186 Calories from Fat 45 % Daily Value* Total Fat 5g 8% Saturated Fat 1g 5% Polyunsaturated Fat 1g Monounsaturated Fat 3g Sodium 402mg 17% Potassium 509mg 15% Total Carbohydrates 35g 12% Dietary Fiber 5g 20% Sugars 6g Protein 2g 4% Vitamin A 429% Vitamin C 6% Calcium 5% Iron 5% * Percent Daily Values are based on a 2000 calorie diet. 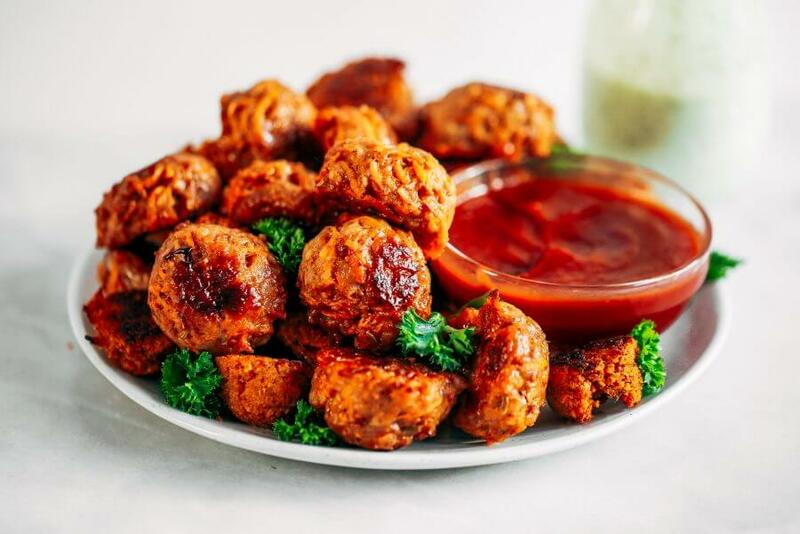 Chipotle sweet potato chicken poppers are paleo, whole30, and so easy to make! These spicy chicken poppers are so flavorful and delicious! A perfect freezer-friendly meal prep recipe. Preheat oven to 400F. Line a baking tray with parchment paper. In a bowl combine ingredients fully, then use a small/medium ice-cream scoop to form poppers and place them on a baking tray lined with parchment paper. Bake on 400F for 15 minutes, then turn poppers and cook for another 5 minutes until golden browned and fully cooked. Nutrition Facts Chipotle Sweet Potato Chicken Poppers Amount Per Serving Calories 58 Calories from Fat 18 % Daily Value* Total Fat 2g 3% Saturated Fat 0.2g 1% Polyunsaturated Fat 0.1g Monounsaturated Fat 1g Cholesterol 17mg 6% Sodium 109mg 5% Potassium 89mg 3% Total Carbohydrates 6g 2% Dietary Fiber 1g 4% Sugars 1g Protein 4g 8% Vitamin A 56% Vitamin C 2% Calcium 1% Iron 2% * Percent Daily Values are based on a 2000 calorie diet. 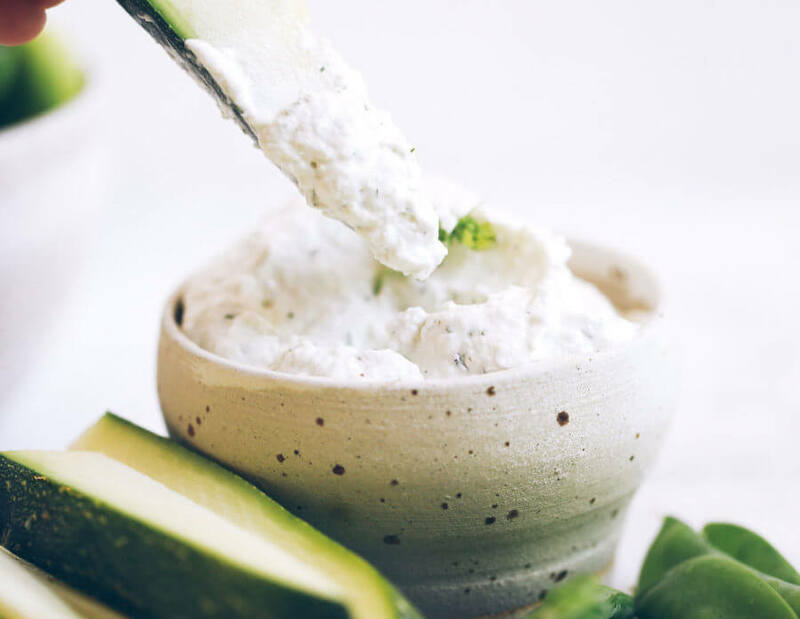 Healthy dairy free tzatziki dip made with coconut yogurt (it’s thick like greek yogurt!!). Made in just a few minutes. Delicious for topping off all your favorite meals or dippings with veggies sticks. Paleo and whole30 friendly. In a food processor blend all the ingredients until smooth, then serve with your favorite dish or store in the fridge. Nutrition Facts Best Dairy Free Yogurt Tzatziki Dip Amount Per Serving Calories 406 Calories from Fat 342 % Daily Value* Total Fat 38g 58% Saturated Fat 36g 180% Polyunsaturated Fat 0.01g Monounsaturated Fat 0.1g Sodium 36mg 2% Potassium 160mg 5% Total Carbohydrates 14g 5% Dietary Fiber 1g 4% Sugars 6g Protein 4g 8% Vitamin A 13% Vitamin C 26% Calcium 3% Iron 3% * Percent Daily Values are based on a 2000 calorie diet. 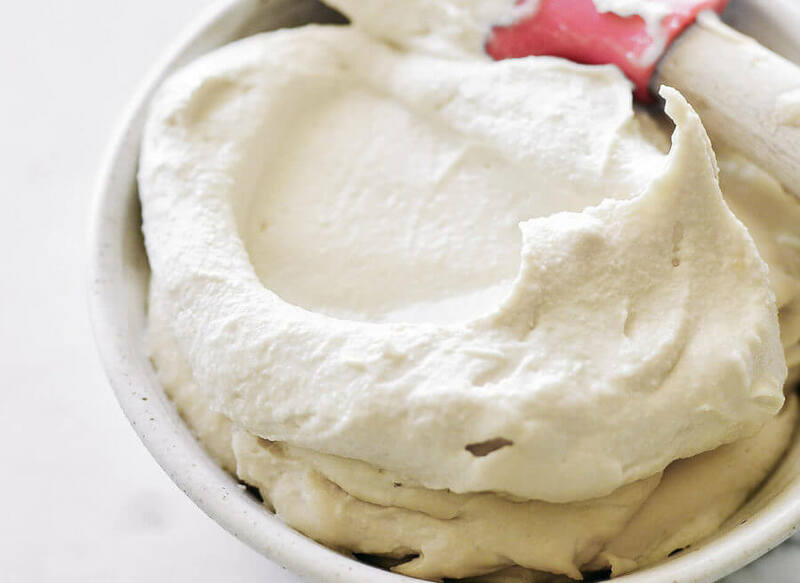 Easy dairy free, vegan, and paleo cream cheese recipe. Soy free, made in 5 minutes, and able to store in the fridge for 1 week. Addictively creamy and a perfect addition to any recipe- savory or sweet! In a food processor (or high powered blender) blend the soaked cashews (drain water from cashews before blending) until they turn into a coarse texture. Add rest of the ingredients. Blend for 4-5 minutes until completely smooth! Once the cashew mixture turns into cream cheese consistency, use it or store in the fridge for up to 1 week. Nutrition Facts Dairy Free Paleo Cream Cheese Recipe Amount Per Serving Calories 86 Calories from Fat 63 % Daily Value* Total Fat 7g 11% Saturated Fat 1g 5% Polyunsaturated Fat 1g Monounsaturated Fat 4g Sodium 0.3mg 0% Potassium 2mg 0% Total Carbohydrates 5g 2% Dietary Fiber 1g 4% Sugars 1g Protein 3g 6% Vitamin A 0.004% Vitamin C 1% Calcium 1% Iron 6% * Percent Daily Values are based on a 2000 calorie diet. 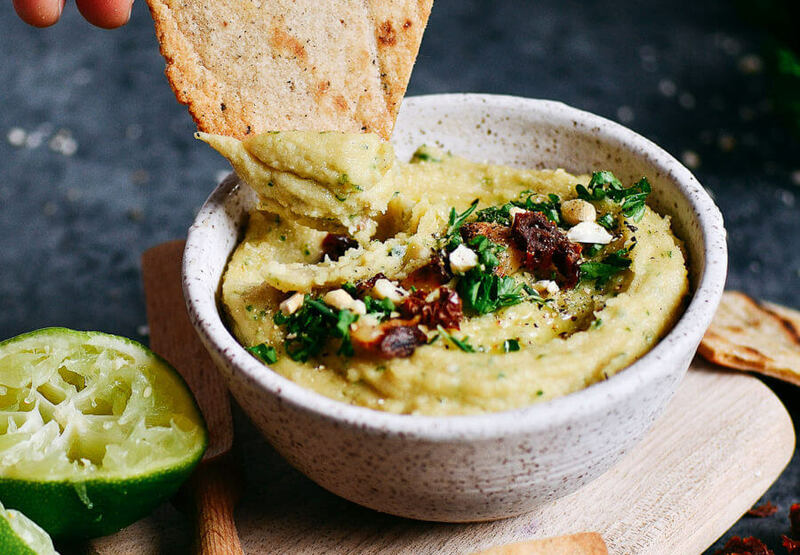 5 minute garlic lime cashew hummus is made without beans (gasp!). Deliciously creamy, smooth, and full of flavor! Whole30 and paleo friendly. Served with paleo cassava flour pita chips! 1 1/2 cup soaked raw cashews to make: soak in hot water for 1 hour until soft. 1 head roasted garlic to make: cut in half, drizzle with olive oil, bake on 400F for 35 minutes. Make sure you have soaked cashews and have baked garlic on hand. If not, then take the time to do this first. 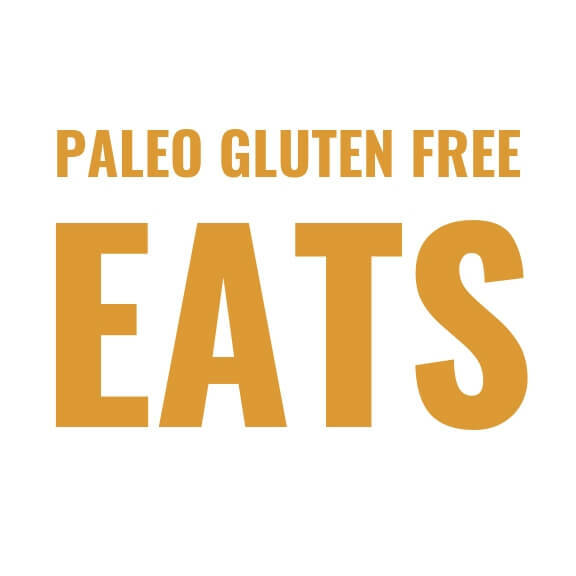 Also, if you want to serve with paleo pita chips prepare the paleo cassava flour tortilla recipe, because it will be used to make pita chips. See instructions in recipe. Begin by combining all ingredients for hummus in a food processor. Puree until smooth. Make sure you have soaked your cashews and baked the garlic. If not, then take the time to do this first. Plate and top off hummus with optional toppings. To make the pita chips, take the paleo tortillas, cut them in quarters, then spread out on a baking sheet. Cook the chips on 400F for about 20 minutes, turning on occasion to ensure even crisping. Leave the chips in the oven more or less depending on personal preference of crunchiness. Nutrition Facts Garlic Lime Cashew Hummus Amount Per Serving Calories 143 Calories from Fat 108 % Daily Value* Total Fat 12g 18% Saturated Fat 4g 20% Polyunsaturated Fat 2g Monounsaturated Fat 6g Sodium 0.5mg 0% Potassium 5mg 0% Total Carbohydrates 6g 2% Dietary Fiber 1g 4% Sugars 2g Protein 4g 8% Vitamin A 1% Vitamin C 2% Calcium 2% Iron 8% * Percent Daily Values are based on a 2000 calorie diet. Extra crispy sweet potato fries loaded with fresh lime zest and baked garlic. These delicious whole30 compliant, paleo fries are a beautiful snacking addiction waiting to happen! 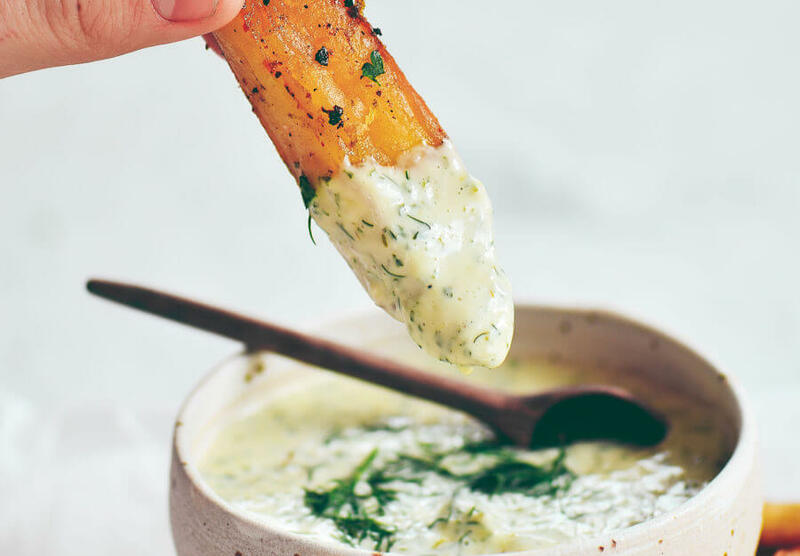 Dipping sauce recipe, make it here. Cut the sweet potato into even medium size wedges or strips. Toss them on a sheet pan with the olive oil, tapioca flour, and seasonings. Spread the fries out evenly on the sheet pan. Bake on 425F for 20 minutes then rotate the fries and cook for another 20 minutes or until crisp. Nutrition Facts Extra Crispy Garlic Lime Sweet Potato Fries Amount Per Serving Calories 211 Calories from Fat 153 % Daily Value* Total Fat 17g 26% Saturated Fat 2g 10% Polyunsaturated Fat 2g Monounsaturated Fat 12g Sodium 714mg 30% Potassium 235mg 7% Total Carbohydrates 15g 5% Dietary Fiber 2g 8% Sugars 3g Protein 1g 2% Vitamin A 185% Vitamin C 12% Calcium 2% Iron 2% * Percent Daily Values are based on a 2000 calorie diet.